It might sound silly….but after 3.5 months of being a minority in the “eastern world,” it’s nice to be back in the west. During the last 36 hours countless people have mistaken us for Germans (including a guy who pulled off the road and asked us a question in German while I was wearing a Notre Dame hoodie). It feels good to blend in for a change! The weather today progressively improved and now we’re back in the apartment enjoying a beautiful evening! 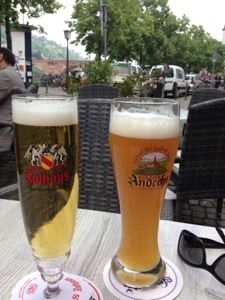 We wandered to the castle today and stopped for a beer and pretzel on the way (duh!). Afterwards we headed to the brewery that our AirBnB host recommended (Kulterbrauerei). 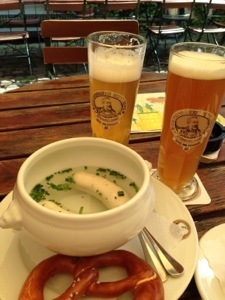 We started with sausage, a pretzel with amazing mustard and their house beer. 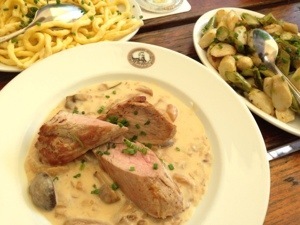 We followed it up with the most amazing pork with mushroom sauce I’ve ever had. We’re pretty sure someone died while we were at Kulterbrauerei. Seriously. First our server and another woman were standing looking out the alley to the street. Then the observers grew to 5 people. We were quite curious after 10 minutes of this so Jeff went to get up and peek. Our server VERY sternly told him to sit down. But he saw a body being wheeled out on a stretcher. Too bad we don’t read German so we can’t look for the news in the paper tomorrow. We meandered back to the tram with a pit stop at GelaTo Go. 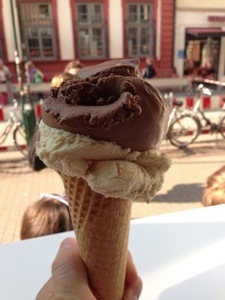 I’ve never had chocolate chili ice cream before…it was spicy enough to make me sweat a little while the ice cream made me cold. Weirdly satisfying! After stopping at the grocery store for dinner and breakfast provisions (hello French red wine! ), we’re in for the night and are planning to get caught up on Community and Game of Thrones. Luckily it’s already 8:30pm so we’ve managed to stay awake to eat some dinner and see the sunset! I love grocery stores…I’ve already spent several minutes wandering the aisles here in Germany 😉 Happy summer!